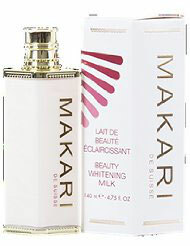 Makari BODY BEAUTIFYING WHITENING MILK is a Light, silky, ultra-rich, skin emulsion that is formulated to restore skin’s moisture and glow. It contains a mild concentration of effective botanical lightening agents that gradually lighten and reduce the appearance of hyperpigmentation, discolorations, stretch marks and signs of premature aging. Use twice daily, morning and night, all over cleansed body. Avoid prolonged sun exposure while using this product.